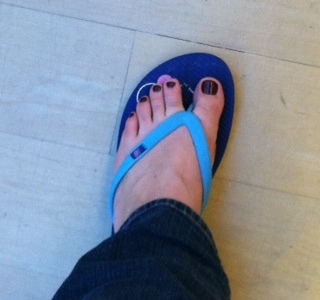 Today I took a little ‘me’ time and I got a mani/pedi. It is going to be a very emotional week (one year since MY MOM died, more on that later) so I was feeling a little bit silly. I noticed my nail place had the new muppet collection posted to the right. I was going to get the green glittery color (fresh frog of Bel Air) and I decided that was a bit too much. 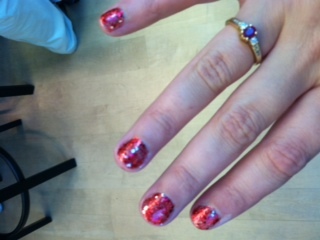 Instead I got the red sparkles (Gettin’ Miss Piggy with it) on my hands and a color called Pepe’s Purple Passion.